These salt painted fireworks are fun to make for any firework holiday like July 4th, Memorial Day or Canada Day. 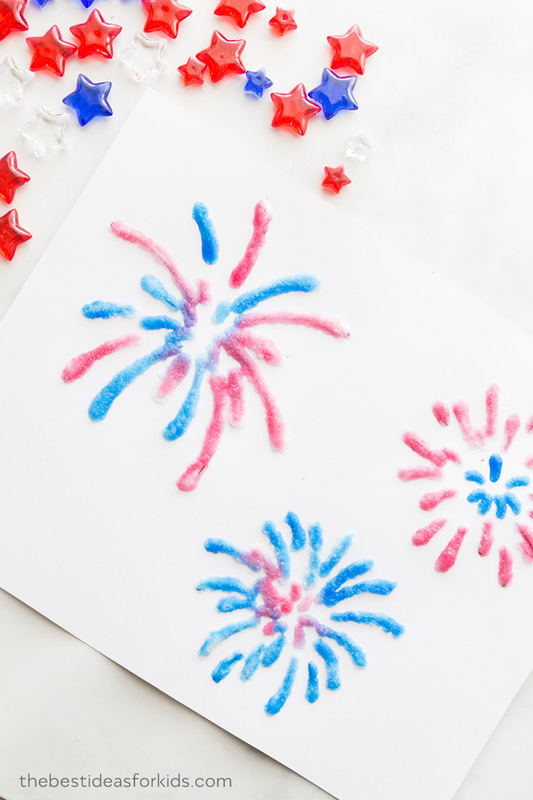 This free fireworks template can be used for salt painting or kids can color and paint them on their own. 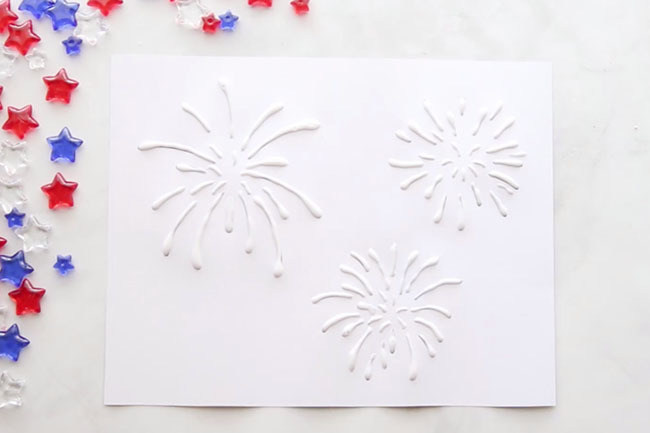 Simply print off the free firework printable and grab some glue, salt and paint! 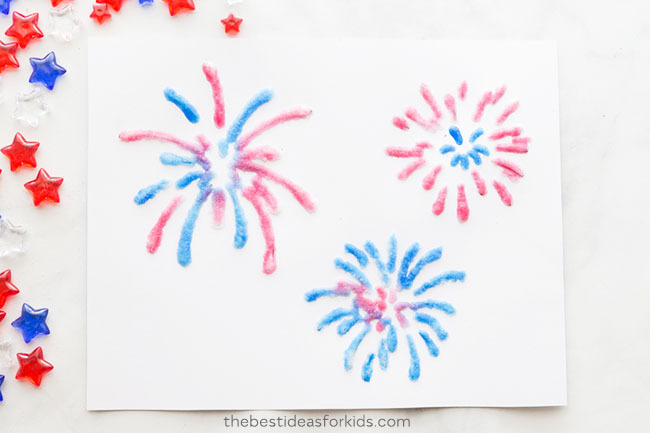 Kids will love painting and creating their own fireworks with this simple painting activity. 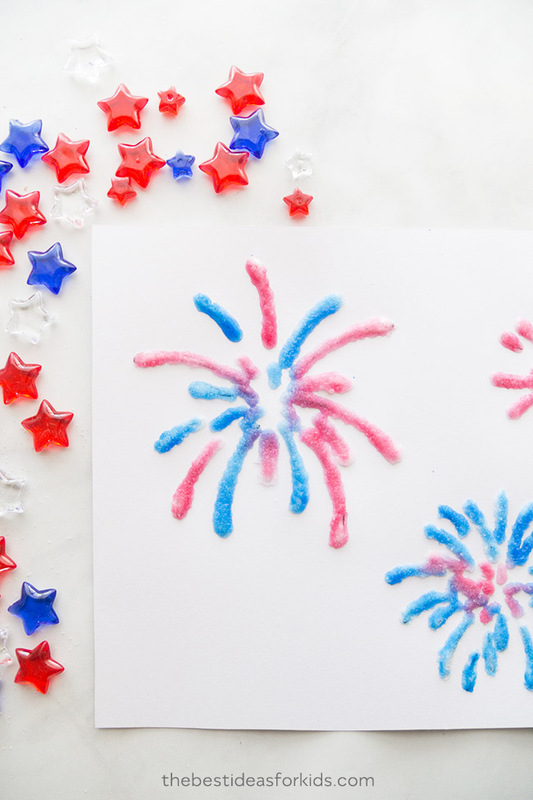 This salt painting activity is easy to set up with our free fireworks template. This template is a free gift to any subscriber. Simply scroll down to the bottom of this post to grab the free template. NOTE: Do not print this image – it is low resolution and not sized for the activity. This is for presentation only. Kids love salt painting! We did salt painted snowflakes in the Winter and they were a huge hit. These fireworks are equally fun! You can mix and match colors or keep red and blue patriotic colors for July 4th. 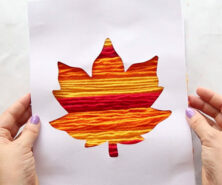 This is also a great fine motor activity where kids can use the glue to trace the template. 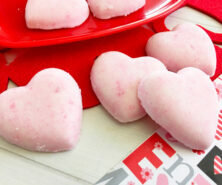 Toddlers and preschoolers will also love sprinkling on the salt. Tip: Getting the extra large cardstock (12 x 12) is usually thicker and will help the paint from running on the paper. 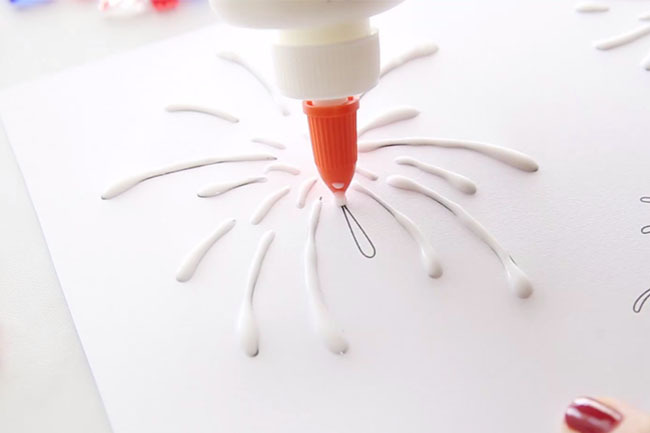 – White glue – this bottle size is the best for tracing our template as the nozzle is small. 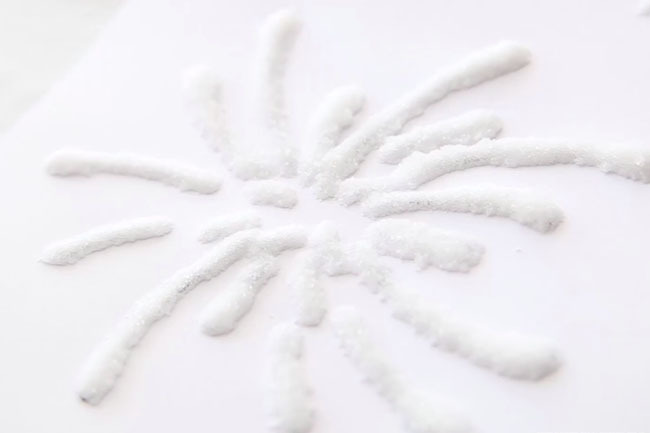 When you add the salt on top of your glue tracing it will keep the fireworks from being too thick. 1. 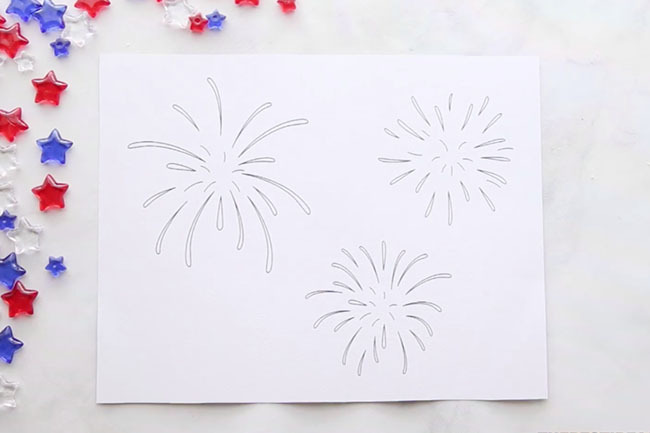 First, print off our free firework template on large white cardstock paper (you can grab the template by subscribing to our newsletter at the bottom of this post). Tip: In order to print on the 12 x 12, cut this paper to an 8.5 x 11 inch size to feed into your printer. The reason we like to use the 12 x 12 size instead of 8.5 x 11 purchased white cardstock is because the 12 x 12 is typically much thicker. If you find an extra thick 8.5 x 11 paper you can still use that! If you don’t want to keep your painting for long, using regular cardstock will work too. However, the painting will run after a few minutes so keep that in mind. 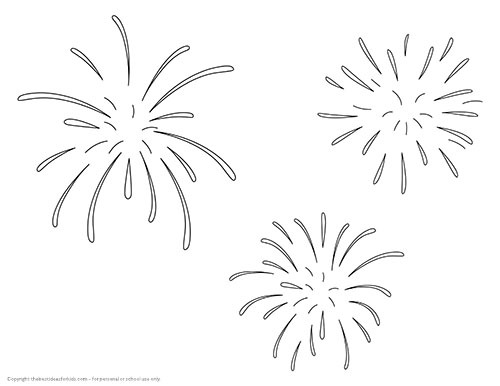 Print off our free fireworks template or you can have kids draw their own fireworks! 2. Begin by tracing the fireworks with your glue. We like to use this bottle of glue since the nozzle at the top is smaller and makes it easier to trace. The larger bottles have larger nozzles and will let out more glue when you use them making the fireworks too clumpy. Finish tracing every line on your page and you’ll end up with something like this! 3. Now for one of the fun parts – sprinkle on your salt! Tip: We like to keep a separate stash of salt for art activities. When you’re done you can scoop off any remainder salt and reuse it for another craft, like making our salt painted snowflakes. Make sure to cover every part of the glue. Pour a generous amount of salt to make sure you don’t miss a spot! You want good coverage for when you paint. 4. 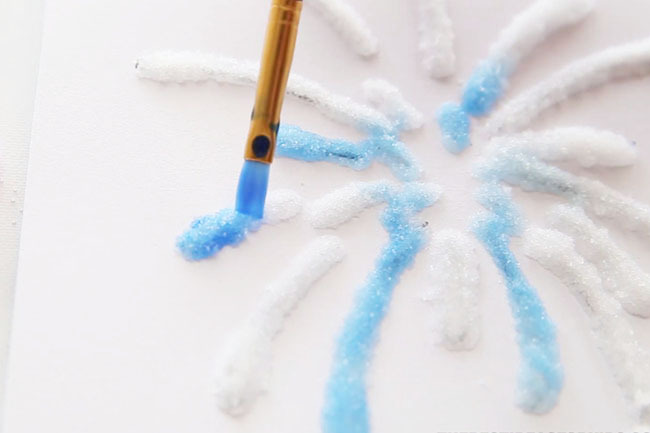 Finally you can paint your fireworks with watercolors! We like to use liquid watercolors as they are easy to use and more vibrant than food coloring, but food coloring would also work. If you’re looking for a low cost brand of liquid watercolors we like these ones. Dilute your watercolors with only a little bit of water to keep the colors vibrant. 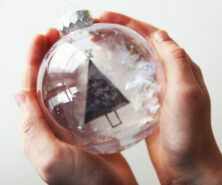 Then watch the magic! Gently tap on the salt and watch the watercolor spread along the fireworks. We mixed up red & blue only for this craft but any color will work. Use a highly concentrated solution of your liquid watercolors. Only add a small amount of water to your solution to keep the color vibrant. Dip your paintbrush gently into your liquid watercolors to get only a little bit of watercolor at a time. If you have too much water when you’re painting the water will spill over and get your paper very wet. This is fine if you’re doing this art activity for fun but if you want to keep your art or are doing this with older kids we found it works best with just a little bit of paint. You can paint after the glue dries or right away – it shouldn’t make a difference! Use some cardboard underneath your cardstock to avoid getting your counter or table wet as the liquid watercolor may seep through a bit. 5. Once you’re done painting, set aside to dry. Be careful not to touch the salt or it may come off. If you accidentally knock off some salt, you can scrape all of the salt off and see a beautiful watercolor painting underneath. Sign up for our Newsletter and get this Firework Template as a thank you! Pin this image to save this post for later! – This summer bucket list has over 100 ideas! 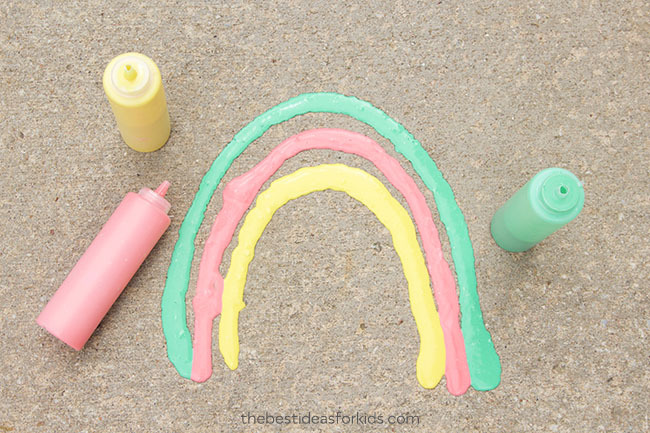 – This puffy sidewalk paint is so fun to make and play with! 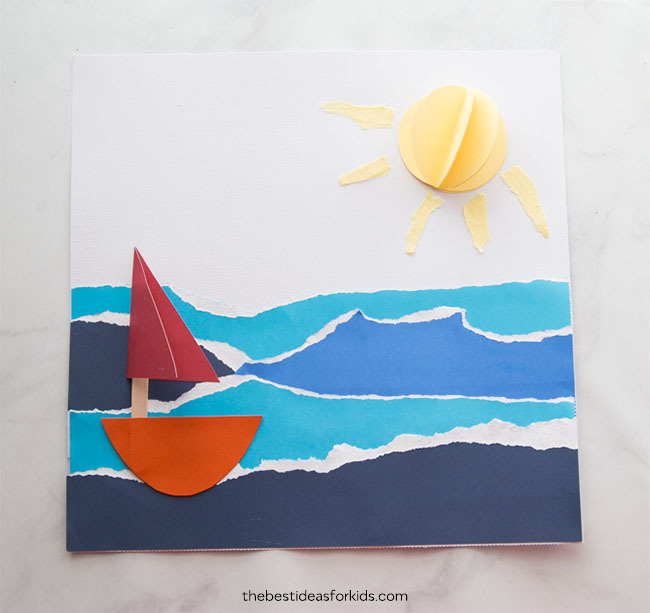 – See also this fun paper sailboat craft for summer! Kids will love tearing the paper and making their own sailboat. Hi Michelle, yes we recommend you actually go to your desktop computer to open and if it still doesn’t download when you click try another browser. Send us an email if you’re still having issues!